Samuel Augustus Nunn Jr. (born September 8, 1938) is an American lawyer and politician. Currently the co-chairman of the Nuclear Threat Initiative (NTI), a charitable organization working to prevent catastrophic attacks with nuclear, biological, and chemical weapons, Nunn served for 24 years as a United States Senator from Georgia (1972 until 1997) as a member of the Democratic Party. His political experience and credentials on national defense reportedly made him a potential running mate for Democratic presidential candidates John Kerry (2004) and Barack Obama (2008). Nunn was born in Macon, Georgia, the son of Mary Elizabeth (née Cannon) and Samuel Augustus Nunn, who was an attorney and mayor of Perry, Georgia. Nunn was raised in Perry. He is a grandnephew of Congressman Carl Vinson. Nunn is an Eagle Scout and recipient of the Distinguished Eagle Scout Award from the Boy Scouts of America. In high school, Nunn was a standout athlete, captaining the school's basketball team to a state championship. Nunn attended Georgia Tech in 1956, where he was initiated as a brother of Phi Delta Theta. He transferred to Emory University in 1959 and received his undergraduate degree in 1960. He then received a degree from the Emory University School of Law in 1962. After active duty service in the United States Coast Guard, he served six years in the US Coast Guard Reserve. He was also briefly a Congressional staff member. Nunn returned to Perry, Georgia, where he practiced law and managed his family's farm. He served as the president of the Perry Chamber of Commerce. Nunn first entered politics as a member of the Georgia House of Representatives in 1968. He was elected to the United States Senate in 1972, defeating appointed U.S. Senator David H. Gambrell in the Democratic primary and U.S. Rep. Fletcher Thompson in the general election. Nunn retired from the Senate in 1997, offering a lack of "zest and enthusiasm" as justification. During his tenure in the U.S. Senate, Nunn served as chairman of the powerful U.S. Senate Committee on Armed Services and the Permanent Subcommittee on Investigations. He also served on the Intelligence and Small Business Committees. His legislative achievements include the landmark Department of Defense Reorganization Act, drafted with the late Senator Barry Goldwater, and the Nunn-Lugar Cooperative Threat Reduction Program, which provided assistance to Russia and the former Soviet republics for securing and destroying their excess nuclear, biological and chemical weapons. The Nunn-Lugar Cooperative Threat Reduction program deactivated more than 7,600 nuclear warheads. He was supposedly a top choice to be Secretary of Defense or State in 1992 and 1996 and in a prospective Gore cabinet in 2000. Overall, Nunn was a moderate-to-conservative Democrat who often broke with his party on a host of social and economic issues. He opposed the budget bill of 1993, which included provisions to raise taxes in order to reduce the budget deficit. He neither supported nor opposed Hillary Clinton's attempt to establish universal health care, though he spoke out very strongly against the proposed insurance mandate. Nunn actively worked to block President Bill Clinton's proposal to allow homosexuals to serve openly in the military. In 2008, Nunn endorsed a new Pentagon study to examine the issue of homosexuals serving openly in the military: "I think [when] 15 years go by on any personnel policy, it's appropriate to take another look at it—see how it's working, ask the hard questions, hear from the military. Start with a Pentagon study." According to opensecrets.org, Sam Nunn received about $2.4 million during his 1989-1994 political career. His main contributors were the finance/insurance/real estate sector (totaling $411,665; $46,660 was received from Goldman, Sachs & Co), the defense industry, lawyers and lobbyists, the alcohol and non-alcoholic beverages industry (including Coca-Cola), and the agriculture sector. He voted in favor of school prayer, capping punitive damage awards, amending the U.S. Constitution to require a balanced budget, and limiting death penalty appeals. On certain issues like abortion, the environment, gun control, and affirmative action, Nunn took a more liberal line. He consistently voted in favor of increased immigration. One of his most controversial votes was his vote against the Gulf War. In September 1994, Nunn, former President Jimmy Carter and former Chairman of the Joint Chiefs of Staff Colin Powell were asked by President Bill Clinton to go to Haiti in order to force the departure of the military dictator Lieutenant General Raoul Cédras. In 1994 Clinton publicly demanded that the Haitian government step aside and restore democratic rule. Clinton deployed a large military force to surround the country in September 1994. Just before the troops reached Haiti, Clinton sent a delegation led by Carter, Nunn and Powell to urge Cédras to step down and leave the country. Cédras agreed and surrendered the government, and he and his top lieutenants left the country in October. Just days later, American forces escorted the country's elected president, Jean-Bertrand Aristide, into the capital. Afterwards, Clinton lavished praise on Nunn's delegation for averting a military strike on the nation. "As all of you know, at my request, President Carter, Gen. Colin Powell, and Sen. Sam Nunn went to Haiti to facilitate the dictators' departure. I have been in constant contact with them for the last two days. They have worked tirelessly, almost around the clock, and I want to thank them for undertaking this crucial mission on behalf of all Americans", Clinton said. Upon his exit from the Senate at the end of 1996, Nunn was the recipient of bipartisan praise from his colleagues. Republican Senator John Warner of Virginia concluded, "Senator Nunn quickly established himself as one of the leading experts in the Congress and, indeed, all of the United States on national security and foreign policy. He gained a reputation in our country and, indeed, worldwide as a global thinker, and that is where I think he will make his greatest contribution in the years to come, wherever he may be, in terms of being a global thinker. His approach to national security issues has been guided by one fundamental criteria: What Sam Nunn believes is in the best interest of the United States of America." Nunn founded the Nuclear Threat Initiative in 2001 and served as co-chairman and CEO until June 2017, when he became co-chairman with Ted Turner and Ernest J. Moniz. In addition to his work with the Nuclear Threat Initiative, Nunn has continued his service in the public policy arena as a distinguished professor in the Sam Nunn School of International Affairs at Georgia Tech. There, he hosts the biennial Sam Nunn Policy Forum, a policy meeting that brings together noted academic, government, and private-sector experts on technology, public policy, and international affairs to address issues of immediate importance to the nation. Nunn is an active Advisory Board member for the Partnership for a Secure America, a not-for-profit organization dedicated to recreating the bipartisan center in American national security and foreign policy. He has signed a number of the organization's bipartisan policy statements on important issues ranging from climate change to enhanced interrogation practices and nonproliferation. Additionally, Nunn serves as Chairman Emeritus of the Board of Trustees for the Center for Strategic and International Studies in Washington, D.C. At CSIS Nunn and former Senator and United States Secretary of Defense William Cohen joined together for a series of public roundtable discussions designed to focus Americans on the seminal issues that the United States must face. The Cohen-Nunn Dialogues featured top thought leaders, public policy experts, prominent journalists, and leading scholars. Nunn is a retired partner in the law firm of King & Spalding. He is a board member of The Coca-Cola Company. In 2005, Nunn teamed up with former Senator Fred Thompson to promote a new film, Last Best Chance, on the dangers of excess nuclear weapons and materials. The film aired on HBO in October 2005. He gave a full presentation outlining his goals at the Commonwealth Club of California. Nunn—along with William Perry, Henry Kissinger, and George Shultz—has called upon governments to embrace the vision of a world free of nuclear weapons, and in five Wall Street Journal op-eds proposed an ambitious program of urgent steps to that end. The four created the Nuclear Security Project to advance this agenda. Nunn reinforced that agenda during a speech at the Harvard Kennedy School on October 21, 2008, saying, "I'm much more concerned about a terrorist without a return address that cannot be deterred than I am about deliberate war between nuclear powers. You can't deter a group who is willing to commit suicide. We are in a different era. You have to understand the world has changed." In 2010, the four were featured in a documentary film entitled "Nuclear Tipping Point," also produced by the Nuclear Threat Initiative. The film is a visual and historical depiction of the ideas laid forth in the Wall Street Journal op-eds and reinforces their commitment to a world without nuclear weapons and the steps that can be taken to reach that goal. Nunn is a Member of the Supervisory Council of the International Luxembourg Forum on Preventing Nuclear Catastrophe, a not-for-profit organization uniting leading experts on non-proliferation of nuclear weapons, materials and delivery vehicles. He also serves on the Board of Advisors for the National Bureau of Asian Research, a non-profit, nonpartisan research institution. In June 2013, Nunn added his voice to public support for an updated nuclear-arms limitation agreement with Russia. The 1992 Nunn-Lugar agreement had just expired at a time of increasing political tension between the two nations. Nunn applauded the determination of Presidents Obama and Putin to renew its core provisions, while urging further work to agree on chemical and biological weapons limits also. Nunn currently serves as a member the Board of Curators for the Georgia Historical Society. He is an advisory board member of Theranos, a Silicon Valley biotech company. On August 19, 2007 Nunn said he would not decide on a presidential bid until after the 2008 primary season, when presumptive nominees by both parties would emerge. However, speculation over a Nunn White House bid ended on April 18, 2008, when he endorsed Democratic presidential contender Barack Obama. Despite having publicly declared his lack of interest in being a candidate for vice president, Nunn continued to be mentioned by some political pundits and politicians as a potential running mate for Obama. In an interview published June 4, 2008 by The Guardian, former President Jimmy Carter said that he favored Nunn (a fellow Georgian) as Obama's possible choice for Vice President. Peggy Noonan, a columnist and former Ronald Reagan and George H.W. Bush speechwriter also expressed her support for Nunn. In an interview with CNBC on August 22, 2008, billionaire investor Warren Buffett said that he favored Nunn as Obama's choice for Vice President. Nunn is married to the former Colleen O'Brien. Nunn met his future wife at the U.S. Embassy in Paris while she was working for the Central Intelligence Agency. They have two children, Mary Michelle Nunn and Samuel Brian Nunn. Michelle Nunn served as CEO of Points of Light and is currently the CEO of CARE and ran unsuccessfully for the Senate in 2014. In 1989, it was reported that Nunn had had a drunk driving accident in 1964. This report emerged during the United States Secretary of Defense confirmation hearings of ex-Senator John Tower. Nunn was opposing Tower due to Tower's alleged drinking problems. Senator Nunn's membership in Augusta National Golf Club became the focus of a campaign by women seeking membership in the exclusive all-male club in 2002. The club had admitted its first African-American member in 1990, but was still closed to women. The Club chose to air the Masters without commercials rather than succumb to the pressure to open admissions to women. In 1990, the Georgia Institute of Technology renamed its international affairs department, the Sam Nunn School of International Affairs. In 1996, Nunn received the U.S. Senator John Heinz Award for Greatest Public Service by an Elected or Appointed Official, an award given out annually by Jefferson Awards. In 2004, Nunn and Lugar were jointly awarded the Heinz Awards Chairman's Medal for their efforts. The Hessian Peace Prize in 2008 for his commitment on nuclear disarmament and for combating nuclear terrorism. 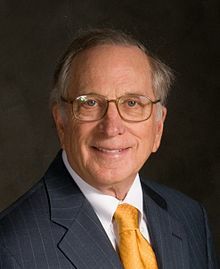 In 2009, Sam Nunn was presented the Lifetime Contributions to American Diplomacy Award by the American Foreign Service Association. 2011 Georgia Trustee. Given by the Georgia Historical Society, in conjunction with the Governor of Georgia, to individuals whose accomplishments and community service reflect the ideals of the founding body of Trustees, which governed the Georgia colony from 1732 to 1752. ^ "OBITUARIES [NATIONAL] Series: OBITUARIES". St. Petersburg Times. August 12, 2000. ^ a b Townley, Alvin (2006-12-26). Legacy of Honor: The Values and Influence of America's Eagle Scouts. New York: St. Martin's Press. pp. 121–122. ISBN 0-312-36653-1. Retrieved 2006-12-29. ^ The New York Times, January 4, 1987. ^ a b c d "A Conversation With Sam Nunn". Georgia Tech Alumni Magazine. Georgia Tech Alumni Association. Spring 1990. Archived from the original on October 28, 2005. Retrieved 2007-03-06. ^ Sack, Kevin (October 10, 1995). "Nunn, Model Southern Democrat, To Retire From Senate Next Year". The New York Times. Retrieved 2007-12-31. ^ "A Retreat on Gay Soldiers". New York Times. 1993-09-19. Retrieved 2007-03-10. ^ Kasindorf, Martin (1993-03-30). "A Plan for Military Gays; Nunn would keep them 'in the closet'". Newsday. Retrieved 2007-03-10. ^ Says Nunn: It might be time to take another look at 'don't ask, don't tell', ajc.com; accessed February 27, 2017. ^ Profile, opensecrets.org; accessed February 27, 2017. ^ Immigration profile of:Sen. Sam Nunn (D-Georgia), NumbersUSA.com; retrieved October 25, 2007. ^ Government & Politics:Sam Nunn, The New Georgia Encyclopedia; retrieved October 25, 2007. ^ "President Carter Leads Delegation to Negotiate Peace With Haiti". cartercenter.org. Retrieved February 27, 2017. ^ "The Sam Nunn School of International Affairs". inta.gatech.edu. Georgia Institute of Technology. Archived from the original on May 18, 2008. Retrieved February 27, 2017. ^ "Bipartisan Policy Statements". PSAonline.org. Retrieved 2017-02-27. ^ "Cohen-Nunn Dialogues". csis.org. Retrieved February 27, 2017. ^ Maclin, Beth (2008-10-20). "A Nuclear weapon-free world is possible, Nunn says". Belfer Center, Harvard University. Retrieved October 21, 2008. ^ NBR Board of Advisors; accessed February 27, 2017. ^ "Obama, Putin to sign new deal on reducing nuclear threat". Reuters. Jun 17, 2013. Retrieved July 2, 2013. ^ Galloway, Jim (19 August 2007). "Former Sen. Sam Nunn Weighs Run for White House". Atlanta Journal-Constitution. ^ "Sam Nunn lines up behind Barack Obama as best equipped to stop political 'demonizing, dumbing down'". Atlanta Journal-Constitution. April 18, 2008. Retrieved February 27, 2017. ^ Peterson, Larry (March 30, 2008). "How about an Obama-Nunn ticket". savannahnow.com. Archived from the original on May 9, 2008. Retrieved April 29, 2008. ^ Mooney, Alexander (May 21, 2008). "Carter: Obama-Clinton ticket unlikely". blogs.cnn.com. Retrieved May 21, 2008. ^ Brooks, David (May 29, 2008). "The Running Mate Choice". The New York Times. Retrieved May 21, 2008. ^ Freedland, Jonathan (June 4, 2008). "US elections: Jimmy Carter tells Barack Obama not to pick Hillary Clinton as running mate". The Guardian. London. Retrieved May 23, 2010. ^ Has Sam Nunn's time for VP spot arrived?, ajc.com, July 12, 2008. ^ Galloway, Jim (July 22, 2013). "Michelle Nunn declares herself a U.S. Senate candidate". The Atlanta Journal-Constitution. Archived from the original on April 25, 2014. ^ "Nunn Admits Being Drunk In '64 Crash". Atlanta Journal-Constitution. Retrieved July 22, 2008 – via newsbank.com. ^ Sandomir, Richard (September 28, 2002). "GOLF; Women's Group Lobbies Seven of Augusta's Members". The New York Times. Retrieved February 27, 2017. ^ "National - Jefferson Awards". JeffersonAwards.org. ^ "The Heinz Awards :: Richard Lugar + Sam Nunn". heinzawards.net. ^ LUKA netconsult GmbH. "Hessian Peace Prize". hsfk.de. ^ "Georgia's New Trustees". georgiatrend.com. ^ "Ivan Allen Jr. Prize for Progress and Service - Ivan Allen College of Liberal Arts". gatech.edu. ^ Lingenfelser, Mike. "Ein Verdienstkreuz am Rande" [A Cross of Merit on the Edge]. Bayerischer Rundfunk (in German). Archived from the original on February 8, 2013. Retrieved March 5, 2018. ^ "Sam Nunn to be honored by Navy Memorial". Navy Times. 4 September 2014. Retrieved 13 October 2014. McElroy, Roland. 2017. The Best President the Nation Ever Had: A Memoir of Working With Sam Nun. Macon, GA: Mercer University Press. Wikimedia Commons has media related to Sam Nunn.